138 Players Polled: 60% of the players polled say that Alex Smith should be able to return as the starting quarterback of the 49ers, while 40% say to let Colin Kaepernick keep playing. San Francisco’s head coach, Jim Harbaugh, says he'll settle on his starting quarterback for this Sunday’s game on Wednesday. Colin Kaepernick has had two good starts, but will Alex Smith get to keep his job after recovering from a concussion? SOTL.com, The Voice of the Players, polled more than 138 current and former NFL players and asked their opinion as to who Jim Harbaugh should start. 60% of the players polled say that Alex Smith should be able to return as the starting quarterback of the 49ers, while 40% say to let Colin Kaepernick keep playing. Fan votes differ slightly with a 55% / 45% ratio. To read all players and fan comments, visit http://www.sotl.com. SOTL.com was founded in 2009 as a social media and news site, an Officially Licensed Product of the NFL Players Association, and serves as "The Voice of the Players”™ with more than 2,500 current and former players contributing to the site. SOTL.com features weekly football and lifestyle blogs by dozens of NFL players and alumni, including Jerome Bettis, Barry Sanders, Patrick Peterson, Will Smith, Dwayne Bowe, Cliff Avril and others. SOTL.com is the player’s site where they comment directly on football news stories of the day and contribute to exclusive player polls that give fans their perspective on the league’s most important issues. The sister site, SOTLTraining.com, is the premier online source for football training classes with the instructional video series “Legends in Training” that feature players such as Peyton Manning, Larry Fitzgerald and Tony Gonzalez to name a few as well as instruction from professional coaches and trainers. 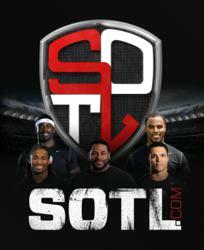 SOTL.com and SOTLTraining.com are official licensed partners of NFL Players, Inc.